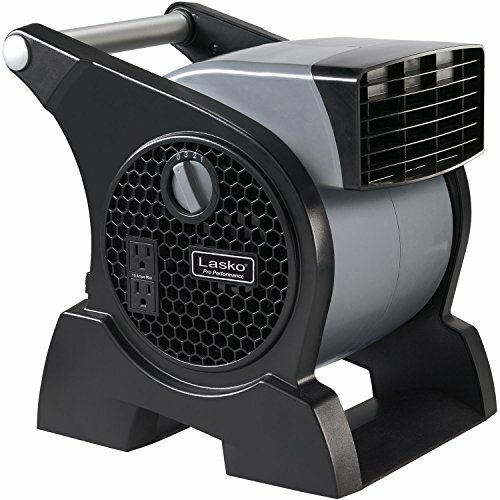 Lasko pro-performance High velocity utility fan features a multi-purpose, pivoting blower, making it ideal for moving Air in garages, workshops, work sites, and for floor and carpet drying. High velocity airstream for cooling, ventilating, exhausting and drying. Three performance speeds. Ten foot cord to get the Air where you need it. Two 120 Volt accessory outlets on the side, with circuit breaker, to allow units to be used in a chain. Comes fully Assembles. Etl Listed. 125 watts. 10 ft cord. Gray/Black.